MOLLUSCA : NUDIBRANCHIA : Heroidae SNAILS, SLUGS, ETC. 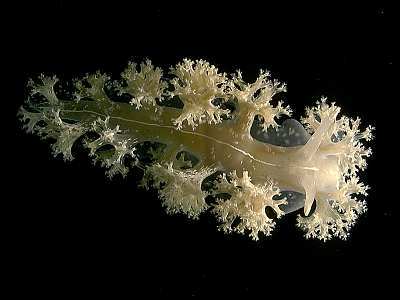 Description: A peculiar-looking nudibranch with a single row of bushy, branched appendages down each side of the body and across the front of the head. It has large propodial tentacles at the front of the foot. The overall colour is pale pinkish-brown with white spots scattered down the body and a white centreline along the back. The erect rhinophores are smooth and finger-like, with white tips. Up to 40mm in length. Habitat: The food is uncertain, though animals have been found associated with various hydroids including Nemertesia ramosa. Recent diving observations are from wrecks and muddy sand habitats with scattered shell and rocks. Distribution: A scarce species, most recent records are from the west coast of Scotland, near Oban. A specimen was recently found with the deep water coral Lophelia from the continental slope of the Rockall Trough, indicating a considerable depth range. Branching ceratal processes along sides of body and across front. White centre-line down middle of back. Picton, B.E. & Morrow, C.C. (2016). Hero formosa (Lovén, 1841). [In] Encyclopedia of Marine Life of Britain and Ireland.